Do you want a subtle exterior improvement for your BMW F22 2 series? RW Carbon has just what you need with these beautiful Gloss Black Double Slat Grilles. 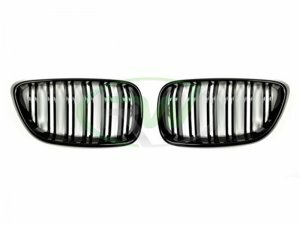 These grilles comes in pairs and are made out of durable ABS plastic. Installation is a breeze, only taking 30 minutes to an hour to install. They use the same mounting location tabs as your OEM kidney grillles.